Meanwhile back in Minnesota, I received a conference call from USLCI powers-that-be, concerning the release of the highly anticipated NEW FZ09 Engine package along with the 5 new cars that we had on order. 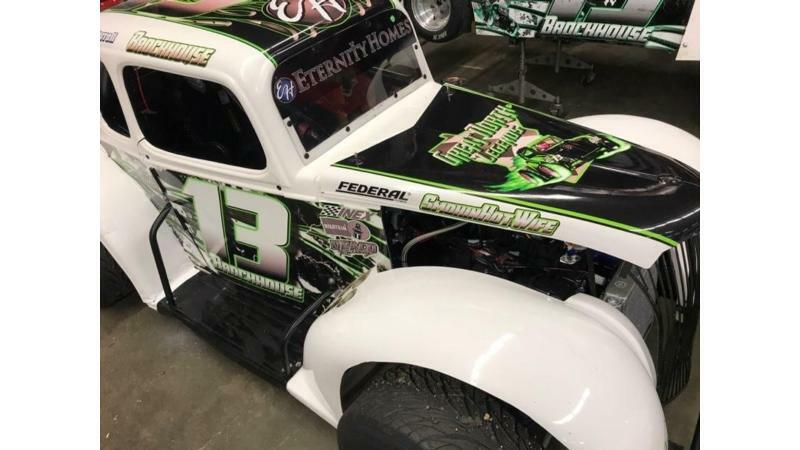 So, without hesitation, Baiden Heskett and I decided to make the 19-hour journey and take one on its maiden voyage at the Bojangles Summer Shootout at Charlotte Motor Speedway. My 8-year-old son Ayrton has been bugging me to race bandoleros there after watching our hometown hero Derek Lemke win a legends race on Legendsnation.tv a couple weeks before, so the Bando was loaded as well. 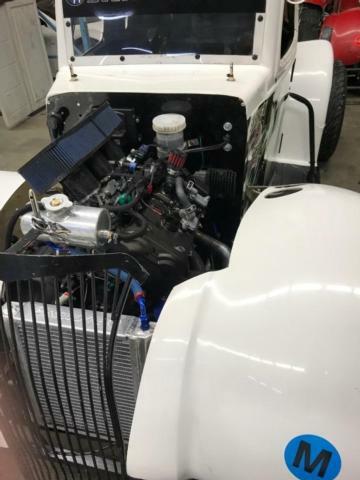 Originally, we were going to run one of the new cars, but with time constraints, we decided it would be easier and a better judge of performance to install a new engine in the trusty 13 car. In about a 4-hour span, my guy Baiden and the guys in the fab and engine shops tore this thing apart. The body was removed, engine and unnecessary components gutted, new engine, wiring harness, clutch pedal assembly, fuel pump & regulator, radiator, and a whole bunch of stuff I had never seen before were installed and readied for competition. First off, you can't help but notice there is a lot more room in the engine compartment. With the elimination of one cylinder and carburetors, the upright location of the throttle body and velocity stack style single element air filter, clutch master cylinder is not necessary since it is cable operated. Several other noticeable factors are some electrical additions such as relays, plug-in doo-hickeys, and a few what-cha-ma-call-its that I still have no clue what they do, but I'm told they are necessary. The 70 lbs. lighter weight engine proposes a few setup challenges as you are forced to move some weight around to get your percentages right. Overall the car can weigh 50 lbs. less, meaning we had to add a 20-pound stick somewhere and the only choice was on the front of the car since the 52% rule was now way over. Right side weight was easily obtained since the decrease in mandated weight is symmetrical with 615 minimum right-side vs 640. Just looking at scale numbers we were surprised how balanced the car was without the driver, and once inside the car, we basically got right back to where we were normally minus the missing weight. Off to the race track we go. We ran the car at Charlotte for Shootout practice but ran into a few electrical gremlins, which forced us to have very few laps under full power. The guys from the USLCI were all over it and found a loose wire on one of the injector plugs and we were back on track. It was hard to make any sort of opinions on the new package with so little time on it, however, it had a different feel that was hard to put a finger on. I wasn't used to and didn't like the "Charlotte setup" so it didn't help with our impressions. We ended up with a respectable time in the last practice which gave us much excitement for the following day. Without much practice, we decided to go back to our basic setup, so I would be more comfortable in the car having more confidence and knowing the expectations of what we normally run at short, flat tracks. We took over the production shop area as we really had nowhere else to do our setup, and the guys in the shop were extremely hospitable in letting us have a place to work on our stuff, but now they all know our secrets! The guys at the USLCI Engine shop put the car on the dyno and re-mapped the ECU. We only had the initial start-up mapping on it since we were under the gun to get the car to the track the day before. Initial Dyno numbers were 115 HP and 65 ft. lbs. of torque. Not bad at all considering the bike is published at 113 HP and 64 Torque (at the rear wheel). This is accomplished with a different cam profile, a custom airbox, and a proprietary ECU all exclusively made for USLCI. Now comparably, some may say that is quite a difference from the numbers we have previously seen from the 1250, however, USLCI has installed a new state-of-the-art dynamometer that is extremely accurate and represents numbers that are in tune with what YAMAHA has published for the motorcycle engines. The 1200 has 125 BHP factory stock, and that was at the crankshaft, rear wheel HP was around 112, 79 for torque in the tests that some of the major magazines did at the time of release, so the inflated numbers that we have been accustomed to were either not accurately corrected for altitude, humidity, barometric pressure etc. or just highly exaggerated. Our only modifications are a carb kit, air filters, and exhaust system which is impossible to get the increased numbers that have been making their way around the web lately. So I digress, if you superimpose the graphs from the 1250 on top of the FZ09, the 1250 is noticeably stronger on the bottom end with an extra cylinder and larger cc. However, once the FZ09 is in its powerband, it lacks no more. The torque curve on the FZ09 levels off rather than dying like on the 1250. HP numbers continue to climb until it bumps off the rev-limiter, compared to the 1250 which takes a nose-dive way before its maximum RPM. As a numbers guy, I was impressed with the comparison and obviously, the new engine package should have its weaknesses and strengths with these results. We got to the track and with the ROVAL testing, no practice and there was a delay. My son Ayrton got to meet the Champ Martin Truex JR, and also took part in an interview with Lenny Batycki and MAVTV, and the excitement was nearly overwhelming knowing we had to qualify in unknown territory. Well, that came to an abrupt halt as the gremlins returned and our qualifying session was aborted with a down cylinder. Further observation noted one of the coil pack plugs came loose in all of the melee from that day. This was an easy fix and I blamed Douggy back in Minnesota since he wasn't here to defend himself. Once in race mode, the car was noticeably nimble. I could carry corner speed much better than my 1250 counterparts, but also noted that while on someone's bumper, I lacked initial OOMPH and would lose a little ground but would overcome said loss by the end of the straightaway and entry into the corner. The lighter package gave a better braking result and felt I could go deeper into the corner, however, that would put me back in the same predicament of being too close and not being able to pull up under cars at corner exit. A new driving style is what was required, so quickly adapted to backing the corner up and rolling through and up to the car in front giving a better exit speed which overcame any disparity. The biggest difference I found between the two power plants was the invisible wall known as the rev-limiter. There is no warning, no loss of power, no nose dive giving you the slightest hint that you are at the end of its power band. It pulls and pulls all the way through and then bop-bop-bop you are all over the chip. It doesn't hit hard like the 1250 and has a softer feel that is hard to describe, which is much more manageable to drive through which also becomes a good reference point for your corner entry. Due to time constraints and a red-flag incident, the race was called at only 14 laps and we found ourselves in second place all over the leader. Would have been nice to know if we could have gotten it into victory lane in its inaugural run, but we have a pretty good idea of what could have been. I would like to thank Everyone at USLCI, INEX, Great North Legends and everyone that played a hand in letting us be the 'guinea pigs' for the initial competition test of the NEW and IMPROVED Legends Car. Stay-tuned for a recap of our 3 day, 3 car FZ09 competition test in Wisconsin this past weekend. CYA!